Next to the queen bed is a sleeper sofa. Outside is a patio with two chairs. 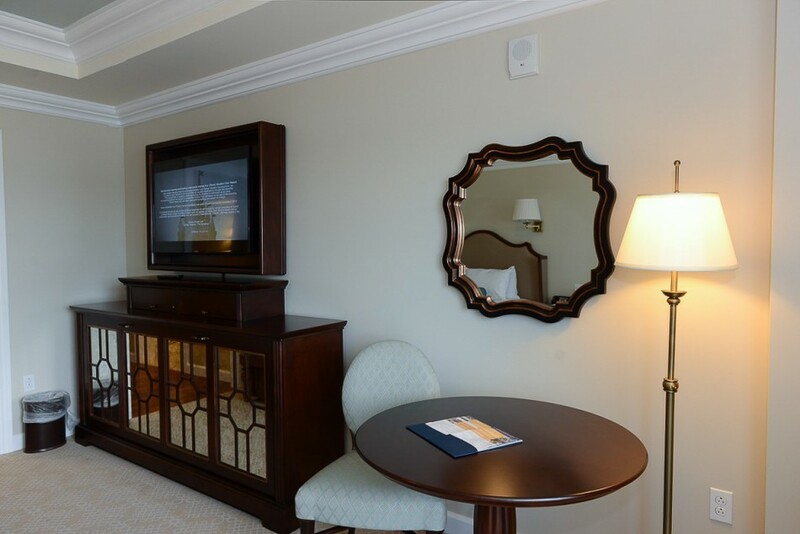 Like the one bedroom at the Grand Floridian, this studio comes furnished with a drop down trundle bed below the TV, making it a room that sleeps five instead of the usual four of other DVC studios. The bed is very easy to fold down and has a sweet scene from Dumbo painted inside. Instead of a dresser, this room has nice big drawers under the bed. 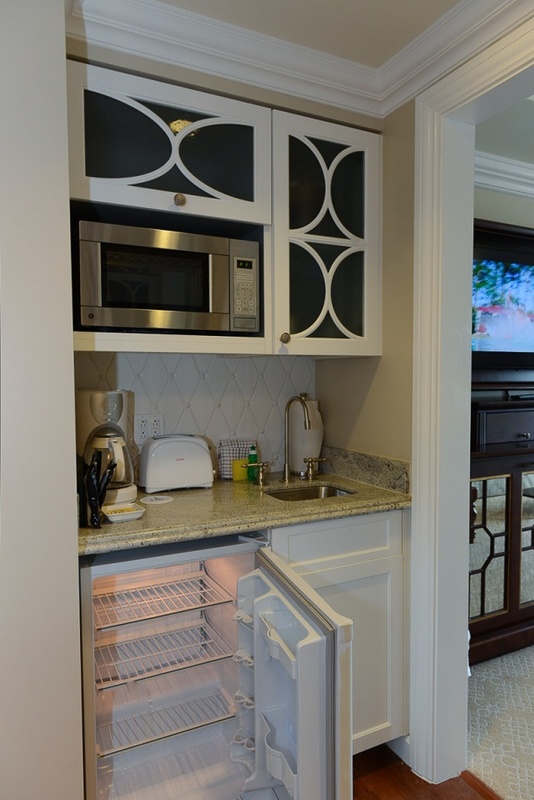 The kitchenette is pretty much the same as it is in other DVC studios with a microwave, mini fridge, toaster and coffee maker. 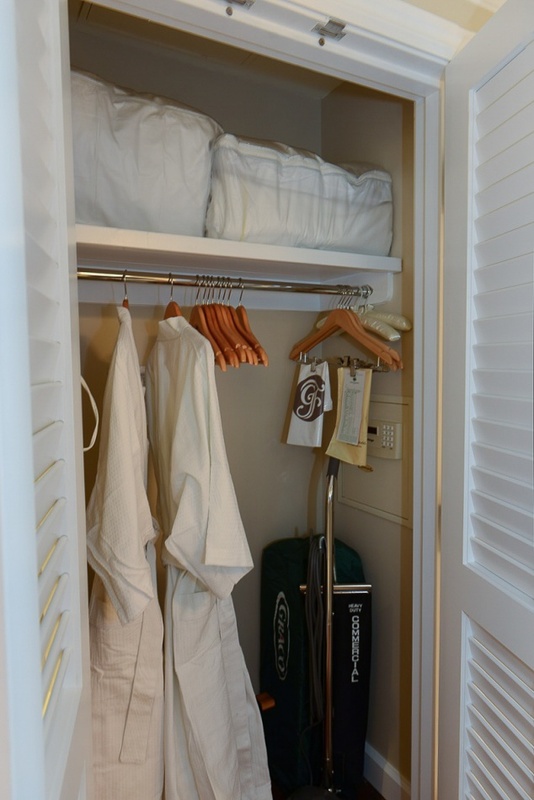 One of the details that lets you know you’re a Guest of the Grand Floridian is the inclusion of robes in the closet. 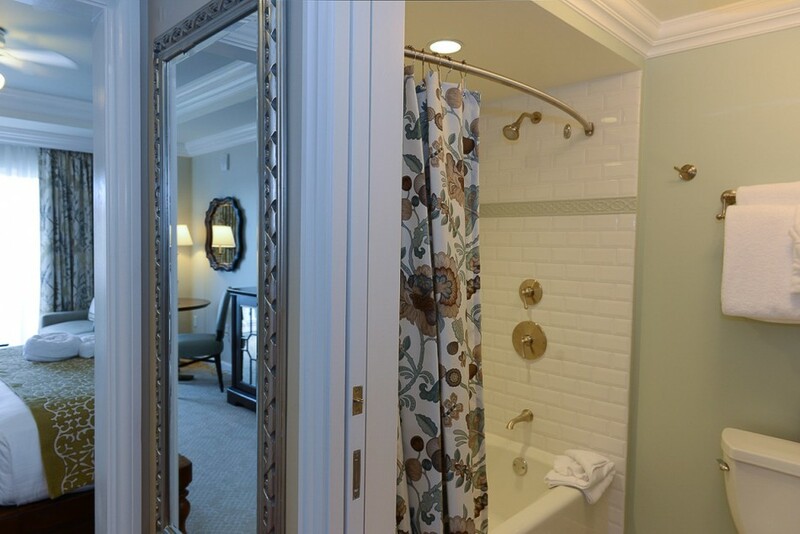 The bathroom is divided into two rooms, separated by latching pocket doors. 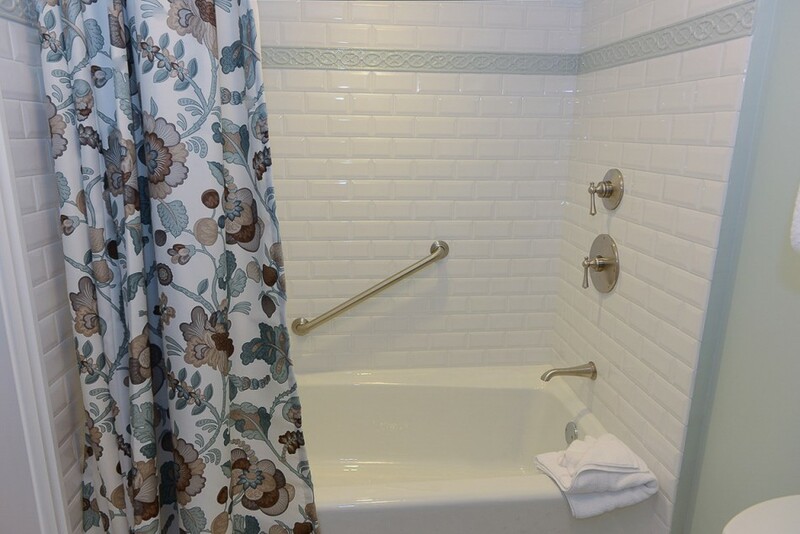 The first has the bath and toilet. 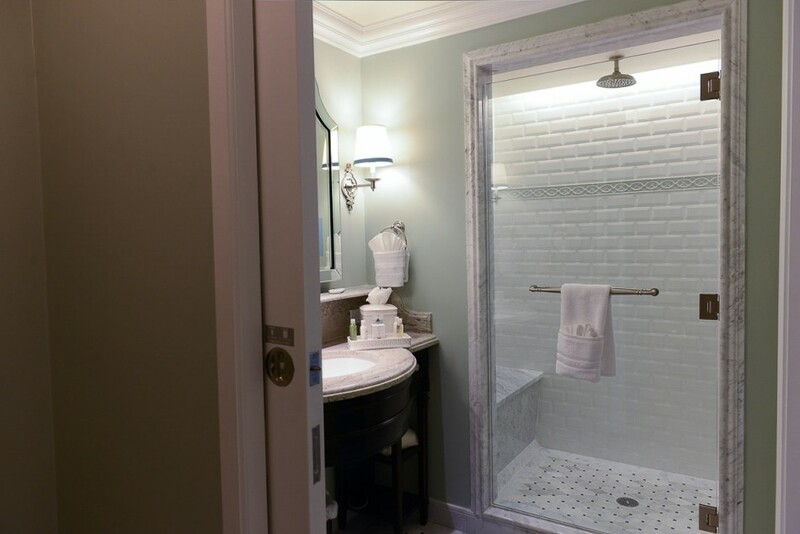 The second room houses the vanity and shower and this is where we see some more of the details that make this room a little more luxurious than other DVC studios. 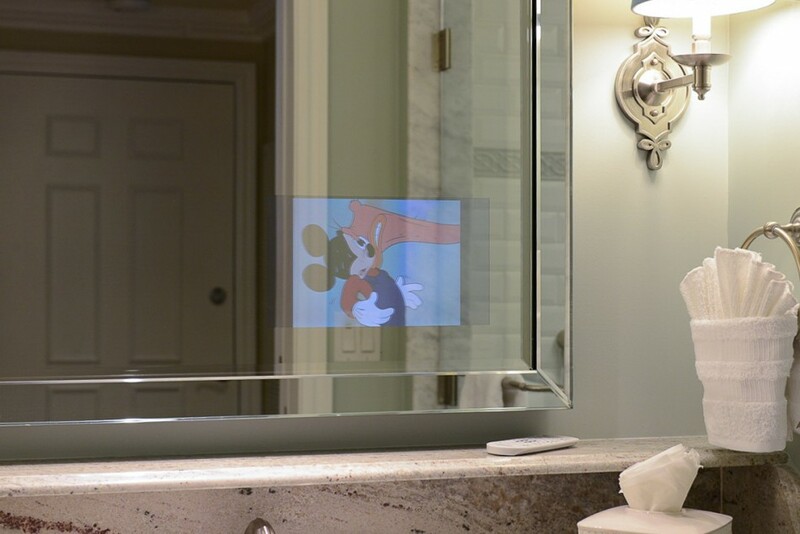 Like in the One Bedroom, the mirror has a TV embedded in the glass. 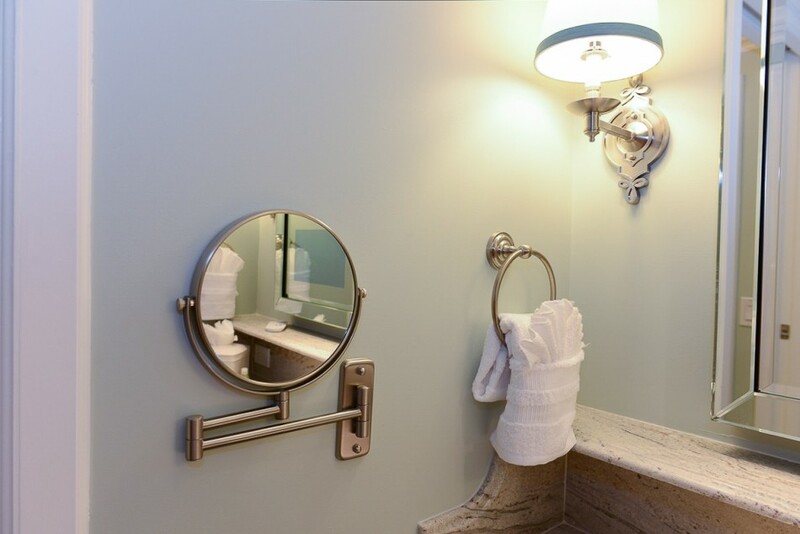 There is also a magnifying makeup mirror on the wall. 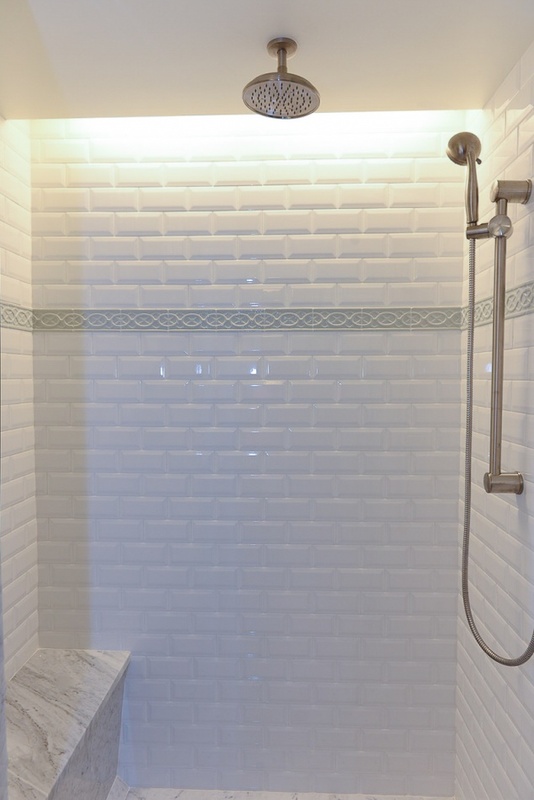 The shower is very smartly designed with a seat and a handheld shower with a long hose. 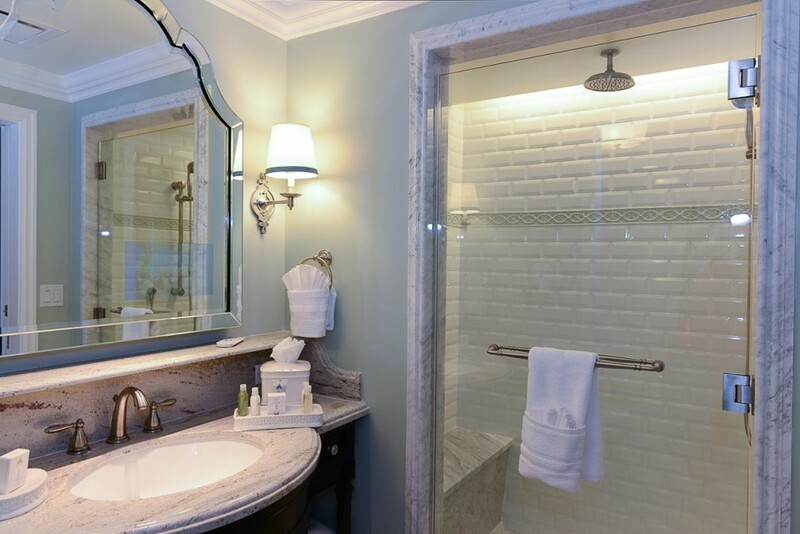 For the luxury touch, a rain shower head is installed in the ceiling. 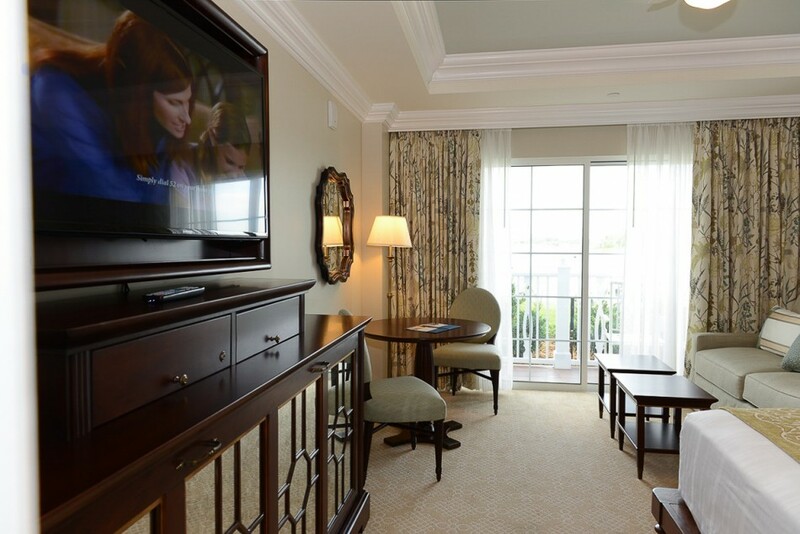 Another thing that makes this room special is its location. 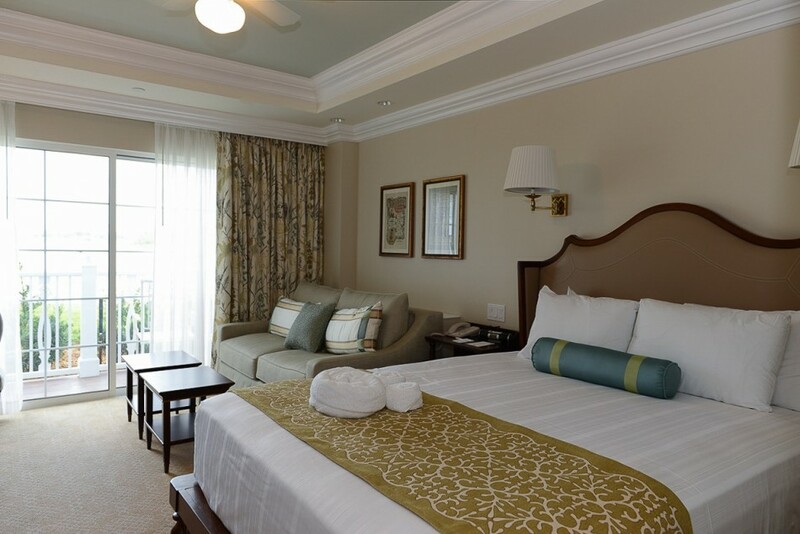 The Grand Floridian is the most lavish of all the Deluxe resorts at Walt Disney World, and the new Vacation Club Villas at the Grand Floridian follow suit. 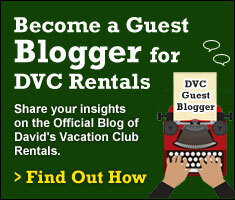 I think DVC hit it out of the park with this new resort. 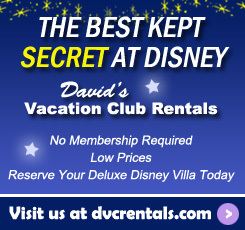 This tour of the Studio Villa concludes my three part series on the Villas at Disney’s Grand Floridian Resort & Spa. 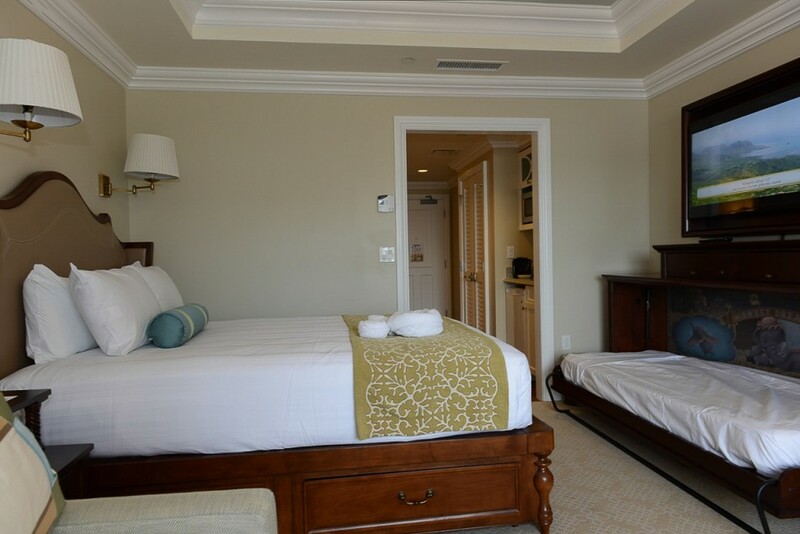 If you missed them, be sure to check out the first two entries: Touring the Newly Opened Villas at Disney’s Grand Floridian Resort & Spa and New, Luxurious One Bedroom Villa at Disney’s Grand Floridian Resort & Spa. 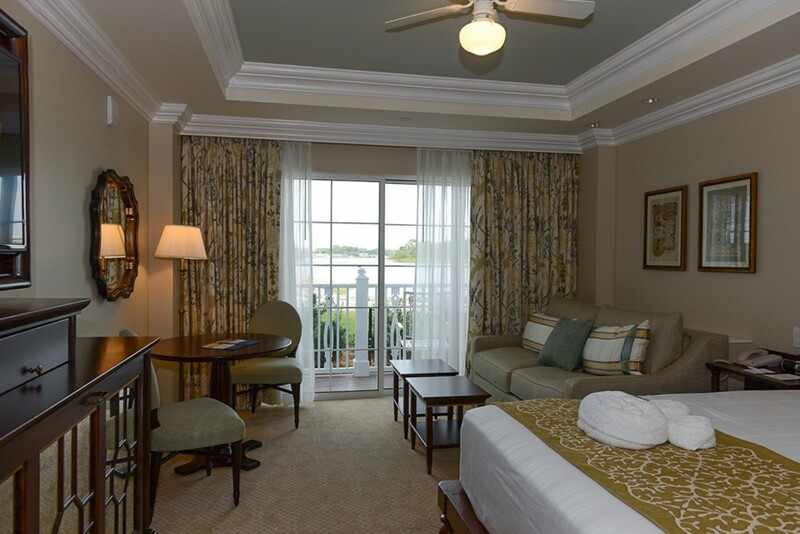 One thought on "New Studio Villa at Disney’s Grand Floridian Resort & Spa"
Does anyone know the exact color of the blueish paint in the lobby hallways of the new Grand Floridian Vacation Club Resort? It is gorgeous.